Cancelling your television service in exchange for streaming movies and shows through the internet is tempting. But cutting the cord comes at a cost. Cord cutting—the practice of cancelling paid television service in exchange for streaming programming exclusively through the internet—seems to be the all the rage. With the number of subreddits and websites dedicated to helping those who want a divorce from their cable or satellite provider, it would seem that cord cutting is an inevitability. And, yes, the concept is tempting: freedom from your monthly cable and satellite bill, total control over your own programming, and never having to throw money at another DVR. With all the benefits of cutting the cord, is this the end of television as we know it? Not exactly. As the cord cutting trend was becoming a national conversation in 2009, just 8 percent of Americans reported increased use of internet and/or free antenna television and decreased use of cable. But as of last year, the number of cord cutters in the nation grew 10.9 percent over the previous year, with an additional 12.5 percent increase in cord cutting expected in 2016. An increase, certainly, but not necessarily an industry disruption. Slightly less than one in three Americans (or about 97 million) still subscribe to cable or satellite TV. In other words, Americans still love traditional television. And for some very good reasons. In addition to Netflix’s 45 million subscribers, an estimated 21 million, or 40 percent of all paying Amazon Prime subscribers, watch Amazon Instant Video. Rounding out the top three cord-cutting products, Hulu most recently reported 9 million subscribers. Many cord cutters use two or more of these services in addition to over-the-air TV, YouTube, HBO’s new stand-alone video app, and individual sports subscriptions. So how much do a la carte services end up costing? Grand total? $79.20 per month. On top of that, cord cutters with multiple device screens often pay up to $20 more per month (in the case of XFINITY) for faster internet speeds. That brings the total to $99.29 per month without many of the channels, sports, live programming, and cheaper internet fees (through bundling) that cable and satellite subscribers enjoy. Suddenly cutting the cord doesn’t look so cheap. Not every cord cutter is consuming that many stand-alone video services. But when considering the cost of internet and even just one or two services, the cost comparison of cord cutting to pay TV is a lot closer than you might think. After all, you can go with DIRECTV’s premium package that includes over 315 channels and still only be paying $89.99 per month for your first year. Sure, there’s value in cord cutting, especially for those with specific tastes who don’t mind a little (and sometimes a lot of) tinkering and/or who are only after a limited amount of content. But if you value ease of use, cord cutting probably isn’t for you. Do you like being introduced to new content from premium stations or enjoy channel surfing? Big fan of live television and live sports? You won’t make a good cord cutter. The fact is that TV revenue has grown every year since the 2009 recession. Primetime viewership has similarly grown in recent years, which means people really like their TV and aren’t as ready to abandon it as reports on cord cutting may lead us to believe. If you’re among the majority of Americans who benefit from bundled TV subscriptions, cord cutting has actually increased the number of options available to you by cable and satellite providers. In an effort to entice and appease cord-cutting and “cord-never” (i.e. people who have never paid for cable) prospects, providers have begun selling their own internet streaming services, set-top boxless plans, and basic network TV in addition to HBO for as little as $10/month (in the case of XFINITY). In that sense, everybody wins. Wherever you fall on the TV-watching spectrum, it’s important to inventory your viewing habits, schedule, and desired content before making a decision. So what do you think? 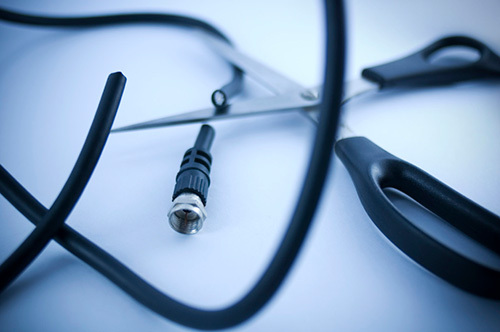 Is cutting the cord the best way to go or is television still king? Let us know in the comments! Find the best cable providers in your area.